South Side 30A Seagrove Beach Vacation Rental House with GULF VIEWS! Relax on this balcony while listening to the soothing waves of the Gulf. Sunset Views of the Gulf Exterior of the home at Sunset. Open and inviting main living area on the 3rd floor. Look how closeto the beach you are 2018 Aerial Update This living area boasts vaulted natural wood ceilings. Spacious and airy kitchen. Additional seating for 2 at the kitchen island. Additional seating for 3 at the bar overlooking the main living area. Formal dining for 8 at the dining room table. 3rd Floor Master with King Bed and En Suite Bathroom. Alternate View of 3rd Floor Master. 3rd Floor Master Bath with Tub/Shower Combo. 3rd Floor Guest Room with Queen Bed. Alternate View of 3rd Floor Guest Room. 2nd Floor Living Area. 2nd Floor Living Area with Ping Pong Table and Large Flat Screen TV. Enjoy Dining Outside on the 2nd Floor Balcony with Gulf Views Built in Bunk Beds in the 2nd Floor Living Area. 2nd Floor Additional Master Bedroom with King Bed. 2nd Floor Bedroom with King Bed and Additional Day Bed. 2nd Floor Master Bathroom with Shower/Tub Combo. Parking for 3 vehicles provided at the home. 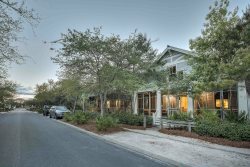 Nestled in a quaint tree lined street of Seagrove Beach, you will find 72 Chelsea Loop. This 4-bedroom home offers the perfect beach getaway with stunning views and the sound of the waves to lure your worries away. Upon entering the foyer, you are greeted with the staircase that leads up to the den and two of the bedrooms. The den offers a flat screen tv, a built-in twin size bunkbed and a ping pong table. The balcony off the living area has seating for six and you can enjoy the views of the gulf, feel the gulf breeze and listen to the sounds of the waves crashing. The first master bedroom is located off the den area. There is a king size bed with ensuite bathroom with a double vanity and shower tub. The second bedroom is located down the hall with a king size bed and daybed. There is an ensuite bathroom with a double vanity and shower/tub. The laundry room has a full size washer and dryer and a powder room is located off of the hallway. As you continue down the hallway you will find a reading nook with ample light. As you continue up the stairs to the third level you will find the main living area. The open concept living, dining and kitchen area has a large flat screen tv and fireplace. The dining table accommodates eight and there is additional seating for three at the bar. The kitchen is open with stainless steel appliances. The balcony of the living area has seating for six and an outdoor dining table for six. This balcony is the perfect spot to gather for dining or just enjoying a quiet evening while listening to the sounds of the gulf. The third bedroom has a king size bed with an ensuite bathroom with a single vanity and shower/tub. The fourth bedroom has a queen bedroom with an ensuite bathroom with a single vanity and shower. If you are traveling with little ones, no need to worry! There is a high chair, pack n play and a baby gate at the home. This home also has a garage for guest use that features parking for 2 vehicles and the driveway can accommodate 1 additional vehicle. We love this house. It was our second stay and we plan to go back.